It will look like we didn't do that much today but the photos are deceiving - many of the churches we visited today did not allow photography. 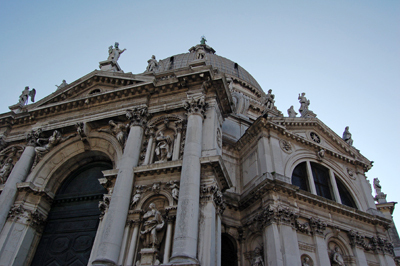 Our first stop for today is Basilica di Santa Maria Della Salute (Basilica of St Mary of Good Health). 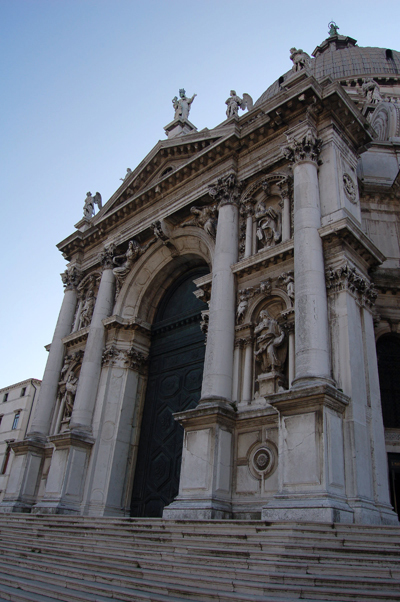 This church was built between 1631-1681 as a dedication to the Virgin Mary to help protect Venice from the many plagues it had suffered. 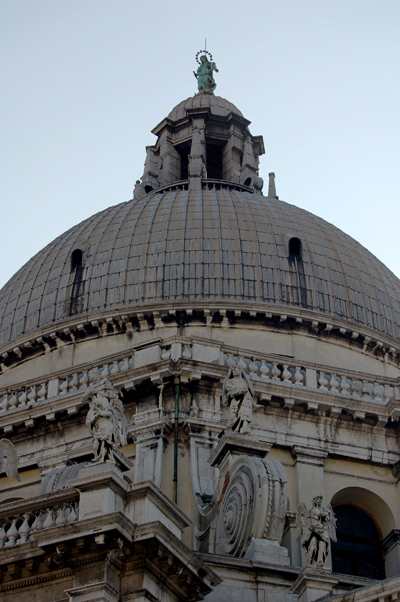 Besides building the church they also set aside 21st November as the Festa della Madonna della Salute. 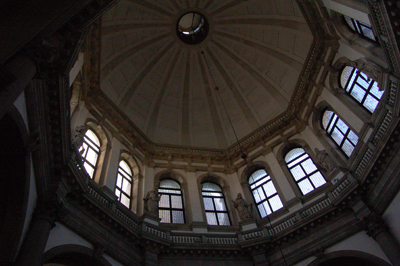 The basilica has an octagonal shape and made from Istrian stone and marmorino. I do so love the beam of light shining down onto the altar. 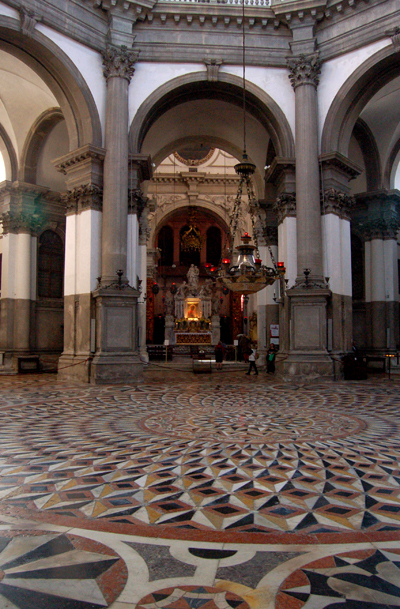 The spiral mosaic on the marble floor represents the 32 roses of the Virgin Mary's rosary. 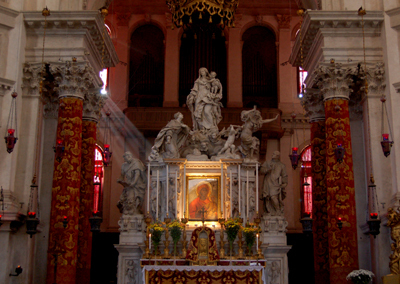 The high altar is baroque and designed by Longhena and showing the Virgin Mary and child , kneeling to one side is the allegorical representation of Venice praying for help against the plague. To the right the figure depicting the plague is seen fleeing. 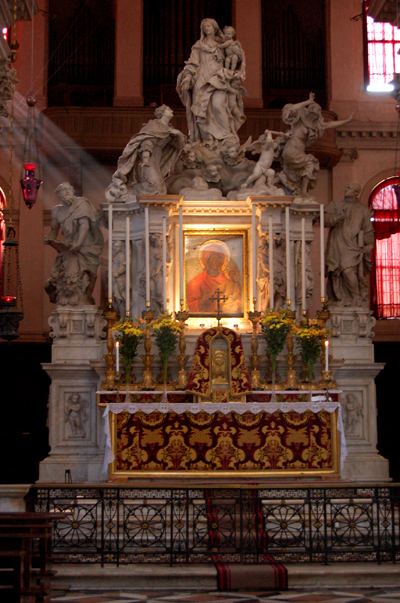 The painting encased in the altar is from the 12th century and is a Byzantine image of the Virgin Mary. It's well worth visiting the Sacristy as it houses works by Titian. 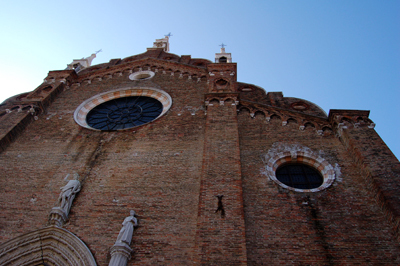 Basilica of Santa Maria Gloriosa Dei Frari is a minor basilica dedicated to the Assumption of the Virgin Mary. 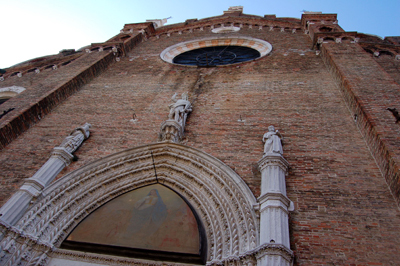 Built in an Italian Gothic Style, work started on the original church in 1250 and finished in 1338. Work then recommenced to construct this larger church, taking more than 100 years to complete. We spent a lot of time inside this church, with its amazing works of art and funerary monuments, it is a must see but please, do respect the wishes of the church and do not try to take photographs. There is nothing more annoying than seeing that flash go off or worse still those that try to take sneaky photos - you really are as pathetic as your behaviour. 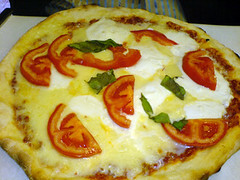 Who says only good pizza is found in Naples? 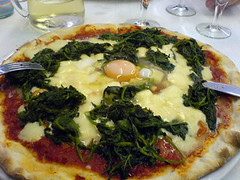 Paalo loved his margarita and I had the rather amusingly named "braccio di ferro" which is arm of iron - it's chock full of spinach and topped at the last moment with a raw egg.